As winter begins to fade, there is an indisputable excitement that clearly indicates Spring is approaching: the release of the McDonald's Shamrock shake. This famous minty-flavored drink has been an popular item on the seasonal menu, reappearing in the market every late February to celebrate St. Patrick’s Day. The shake first appeared in the 1970’s being called the St. Patrick’s Day Shake. However, as the name was not catchy enough, Mcdonald’s took an alternative approach and renamed the drink the Shamrock Shake. And, due to high marketing and advertising, using sayings like “back for a limited time”, a variety of people began noticing this seasonal treat. Since more than 33 million Irish-American people in the United states celebrate St. Patrick’s Day, according to a senior writer, John Kiernan, there will be more of an incentive for them to buy the green drink as it corresponds with the very festive holiday. 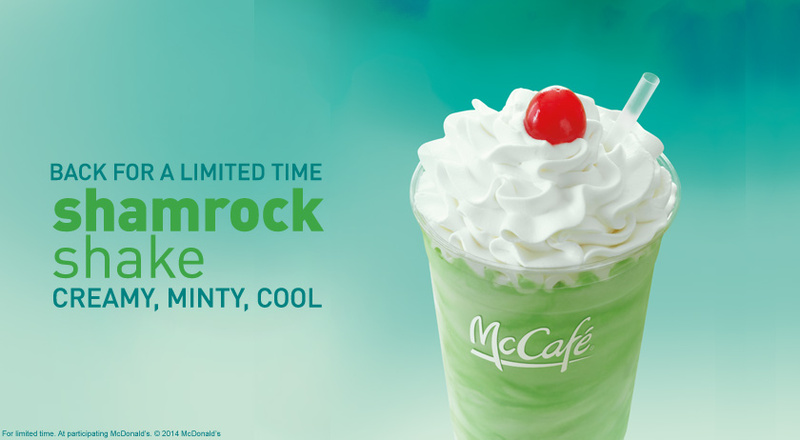 Therefore, as the Shamrock Shake sporadically makes its way back into the Mcdonald’s menu, people will fall into temptation and buy as many Shamrock Shakes as they can before they are gone until 2019. As the popularity of the shake increases, the consumer spending brings us into the economics. Since the most important factor of consumer spending is made up of a person’s disposable income, this gives people the opportunity to make choices on what they spend their money on. Specifically, since the popular shake is a highly-anticipated item - being in demand for months before the release of the shake - people are willing to spend their current disposable income on this product. While the shake is only at a low price of $2, its seasonal aspect only gives consumers so much time before it disappears from the Mcdonald’s menu once again. Since the item is so scarce and supply is low, the demand of the product is extremely high. Even if aspects change of a person’s income, causing their disposable income to either increase or decrease, the scarcity of the shake may still be enough for consumer to spend their money on the delicious minty treat. People all over the nation are anxiously waiting for the Shamrock Shake to arrive at their local Mcdonald’s. Due to the popularity around the item, people would be willing to spend their disposable income on the product, ultimately increasing the country’s GDP for a short amount of time whether they know it or not. I think this is a good marketing technique by Mcdonalds and uses good economic concepts in their marketing. Due to many customers having limited disposable income, the fact that Mcdonalds limits consumption to two months keeps it a novelty item and if they kept it around year round, although it might be popular, the limited disposable income consumers have would cause it to be less popular year round. Overall I think this is a good tactic by Mcdonalds and this strategy has been used by other chains with limited time items. Great article Hailey! This was very interesting to read especially because Shamrock shakes have just been released for this time of the year and they are at a very popular demand for consumers, even consumers that don't go to Mcdonalds regularly. It allows for Mcdonalds to possibly get new customers, keep their constant customers and then of course, increase their attendance. Additionally, due to the popularity of Shamrock Shakes and of St. Patrick's Day, all Mcdonalds should look to receive more revenue and customers in the limited time. Like stated, because this product is available for a short limited time, people would be willing to spend their disposable income on the product, ultimately increasing the country’s GDP for a short amount of time whether they know it or not. It's one of those products, most to all customers will purchase due to the popularity and limited amount of time it is available. Very interesting! This is a very good marketing strategy by Mcdonalds. Many customers love the Shamrock Shake and having it be available for only a limited amount of time causes consumers to want to get as many as possible before the Shamrock Shake is gone. This increases attendance to the restaurants and helps their revenue increase. Because this item is only available for a limited time, people are more willing to spend their disposable income as well. This is a wonderful marketing strategy McDonalds. A lot of customers enjoy the shake but it is only limited to a certain amount of time. Since the shakes are so good, more people are willing to pay higher prices becasue it is only available for a limited time. I think it's a fascinating concept that I never thought about until Economics and Business this year, how seasonal products are used to bring in more customers and promote a business more. When consumers see something new and exciting, it brings them in. And, with the success of the shamrock shake over the years, it allows Mcdonalds to keep bringing it back. I think this a great idea and definitely makes me want to buy one. The demand for this product increases a lot since they also don't announce when the item will stop being produced. This causes consumers to get the item as soon as possible before it is to late. In doing this they make like the shake and have more than one visit after. The trick is they don't get rid of it till the start of April but they make it seem like it is gone after saint Patrick's day. Personally, I love getting an annual Shamrock Shake, so the fact that these shakes are only $2 is crazy to me because they could be charging $3 or $4 and probably keep the same demand for the product. McDonald's is very smart for the way they market this as only a seasonal item and they should continue to keep this tradition because it definitely brings in a great short run profit. I wonder what would would happen if they made a different seasonal item. It is very interesting to think about what a large impact a seasonal product can have on the sales of a company. In the case of the shamrock shake is a smart way to get increased customer flow. The very fact that this shake is around for a two month time period really drives incentive up to purchase the product and is a very successful tactic. Great article! This marketing tactic by McDonald's is without a doubt a great idea. As you said, because the product is only available for the limited amount of time, there is a much higher demand for the product. It's this concept of scarcity that keeps this product so popular during this time of year, as it creates that high demand. 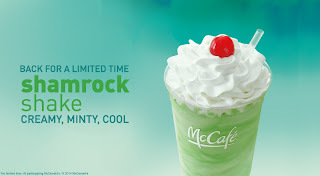 Seasonal items like the Shamrock Shake are a good tactic for fast food restaurants such as McDonalds to utilize. What I have always found impressive about this specific drink is that McDonalds has managed to “hype” up the beverage for many years in a row, and the craze hasn’t seemed to die down (similar to the pumpkin spice latte from Starbucks). Consumers come from many different age groups and many different income levels it appeals to many different crowds, and that can be a part of the reason it is such a success. I really like the limited time offer approach that they are taking because it makes consumers crave it even more. I wonder what the number comparison would be for sales on the year if they sold the shake year round. I still think that they sell more in the period of time that they are available for a limited time. Shamrock shakes are great marketing items, especially since this item is seasonal. They’ve marketed this item so well that they don’t need a ton of advertisement for the drink anymore. It advertises for itself. Being in such high demand, hopefully they will be able to keep up with demands, thus promoting a successful year of sale. This topic is quite relevant due to this item being very popular around this time of year. As for any seasonal food or drink product, it is going to be a hot commodity. It would be interesting to see how this product compares with Starbucks' sales for fall drinks and other companies with similar niches. I really glad I read this for two reasons I like shamrock shakes who doesn't? And it really makes McDonald's look decent because these shakes are pretty high in demand and they are a small cost of two dollars.